Every holiday season it seems the controversy comes back: should religious nativity scenes be displayed in public spaces? Read more about the issues and share your opinion. It's a heated subject that comes up nearly every holiday season these days. Should nativity scenes of the Christian faith be allowed in public spaces such as a courthouse, city hall, school or other government building or land? Or do these scenes constitute a violation of the separation of church and state, which is supposed to be such an important part of the United States Constitution? The proponents of both sides of the debate can become quite passionate and emotional about the subject, and law suits have even been filed either to take down a nativity scene, or to allow one to remain on display. How do you feel about the subject? You can let your opinion be heard below, after reading some of the arguments pro and con, as well as studying cases in the past where nativity scene displays have been challenged. All photos on this page are by the author, sockii. Separation of Church and State is a key element of the United States Constitution. There should be no apparent endorsement or encouragement of one religion over any others by our government organizations. This includes the display of blatantly Christian symbols and scenes in places such as courthouse, city halls, and other municipal buildings. Displays of Nativity Scenes in public spaces are offensive to those of other faiths or who do not follow any faith. It could make someone feel uncomfortable entering a court house or other government building, if he does not share that faith, and make him question if he will be treated equally under the law. If Nativity Scenes are to be displayed in public spaces, it should only be while at the same time that other faiths are also honored as a display of diversity and religious tolerance. Indeed, an argument could (and has) been made that menorahs and the Islamic Star and Crescent can be displayed publicly whereas a nativity scene shouldn't, because the former are both symbols with secular meaning and not just faith-based. The nativity depicts a scene of questionable historic accuracy, therefore is purely religious in meaning and symbolism. No one is telling churches and individuals they cannot put nativity scenes up for display on their own private property. If they're worried about the Christian message being lost in the holiday season, then they can do what they want on their own land. Just keep it off governmental and public spaces. The United States was founded by Christians and the Christian faith has played an important part in shaping this country's laws, government and schools. We should be allowed to honor these Christian roots with displays of the faith, including nativity scenes. The Christian faith is facing increasing persecution by atheists and those of other religions. 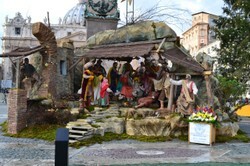 Why, in some cases, are displays of other faiths being allowed while nativity scenes are not? All such displays should be welcome equally provided they are not harmful nor insulting to others. We need to work hard in order to put the "Christ" back into "Christmas." Christmas has become too much a secular holiday about Santa Claus and spending on gifts, and not about the birth of Jesus Christ. The absence of visible nativity scenes is just one symptom of this situation - and we need to encourage their return so that more people think of the religious significance of the holiday. Freedom of Speech and Freedom of Religion are being challenged by not allowing individuals to donate and put up these displays in public spaces if they wish to do so. Many of these public nativity scenes have been community traditions and part of the holidays for decades. It is harmful to the community to allow the objections of a minority of voices to destroy these traditions which have been enjoyed and respected for so long. The links below will take you to news stories of past controversies regarding nativity scenes in public spaces. 2004. A round-up of nation-wide stories regarding the fight between Christian and secular holiday displays, greetings, and even gift-giving in schools. Green Bay, Wisconsin, 2007. Residents sound off with differing opinions over a controversial nativity scene display at City Hall. Warren, Michigan, 2009. A man sues in order to regain the right to display a family nativity scene at a public road median, as he had for over 60 years until being ordered not to do so any longer. Jackson, Mississippi, 2010. News video report on reaction to an atheist display placed next to a nativity scene in a state courthouse. Canonsburg Borough, Pennsylvania, 2010. A small rural town in PA is ordered to remove the nativity scene from a borough building. The nativity, donated by the Knights of Columbus 57 years ago, was relocated to a private business. November, 2012. The controversy heads to court in California where churches sue over freedom of speech, in order to keep up their nativity scene. Wikipedia section on nativity scenes, describing numerous court cases and rulings related to the display of nativity scenes. Are nativity scenes in public spaces a violation of the separation of church and state? No! Freedom of religion should allow anyone to display nativities if they wish, and wherever they wish. Yes, I do believe that it should be okay to put up Nativity Scenes...the hard part about this for me is that this is something, like so many things, that has always been done in the past, and suddenly in our society that is becoming more and more anti-God, anti-Christ, this and so many other things (prayer in school, etc., etc.) are being taken away and more and more anti-God is being added. It is not that Christians are trying to add something that wasn't there, we just want to keep something that was always there in many cases. A story for you...a couple of years ago I joined a group that sang carols in front of a Nativity Scene that we were allowed to put up in front of our Town Hall. We got much support from happy people waving and blowing their horns. The Athiests were also allowed to put up what they wished...and it was an anti-Christmas sign. It didn't last very long at all, a great windy rain storm blew it away...quite a picture to see the tattered, unreadable sign torn down by a storm...perhaps God? and the Nativity Scene still standing! Separation of church and state means the state can't impose a particular religion on its citizens. People should be free to practice their faith openly. Just because some atheists can't handle religious displays doesn't give them the right to outlaw them - that seems like imposition of their "religion" on everyone. I said a lot above, but to me, the taking away of these traditions is so sad. The controversy will always be there. In New Orleans a Christmas tradition called Christmas in the Oaks in a public part has been renamed to Celebration in the Oaks and most decorations are now secular.